This is the first in a series of what will become The Expert Guide to Fulfillment by Amazon. A follow-on to the Beginner’s Guide to Fulfillment by Amazon. Returns are a fact of life in reselling. Possible reasons include buyer’s remorse, a product not meeting a buyer’s requirements, defective products, and, yes, I’ll say it, fraud. Rather than talk to the reasons for returns (since, really, you never do know), I thought I’d talk first about Amazon’s Return policy, then cover some of the ways you can still extricate some level of value, rather than just taking it as a loss. One of the valuable selling points of Amazon, is that it has a pretty relaxed return policy. I know as a consumer, I will buy stuff via Amazon because I know if its not exactly what I’m looking for, I can just drop it in the mail back to them. Specific to the the statement that some products have different policies, you can find those policies here. You’ll note that FBA sellers are held to Amazon.com’s policy, which is pretty reasonable. The best possible option with returns is when they are unopened and Amazon just returns them to your inventory, to be sold to someone else. When that doesn’t happen, like when a customer returns a product as defective, then you have to create a removal order. Unfillable Inventory with a reason. Going through the removal request is pretty easy, you populate where you want it sent, it’ll give you a “Review and Place Order,” and then it’ll give you a confirmation. You will be charged the per-unit fee shown in Fees for the Return and Disposal of FBA Inventory. Removals can take 10 to 14 business days to pick, pack and ship. You will be billed within 45 days of the removal. That is kind’ve vague though, yes, it can take some time to get the products back to you, but as far as the fees, we can do better, as of the date of this post, the fee is $0.50 per standard sized unit, or $0.60 per oversize units. After you’ve submitted the product for removal, you just have to wait, its no fun, believe me, I know, but its all you can do. So the first thing I always do is check to see if the product has been opened. Usually a product that hasn’t been opened wouldn’t even make it my way, but, its always good to check. Then I’ll go about determining it’s condition. There are some that you’ll know right away that it isn’t resellable. In those cases, if it looks like a true product defect, I might consider taking back to the store I purchased it from, or have to accept it as a total loss. More often though, the answer is somewhere in between, where you can just sell it used-like new, or in a condition that you believe is a true representation of the product’s actual condition. For these options you can either continue to do Fulfillment by Amazon, or you can do Seller Fulfilled. Either way, it is additional work, but, might at least allow you to mitigate your losses. Mine was a total loss and I’m a bit P.O. at Amazon. Looks like they just forward the box that was returned to them w/o even looking at it. The box was damaged by water so weak, by the time I got it the product inside was destroyed. It should not have been accepted as a return in the first place. I would’ve photographed it and sent opened a support ticket… That’s unacceptable, Amazon wouldn’t accept it if they were responsible for the bottom line (or I suppose, if they were a for profit business, shouldn’t), why should you? My very first sale, the product was returned (a tablet), and came back to me out of box, with nothing else–no charger, no paperwork, just the tablet. I contacted Amazon, sent pictures of the box and the tablet when requested, and received 1/2 the retail price of the product, in the end. Not the best, but not the worst, either. I recently had my second return, after a multitude of sales. Will find out today the reason it’s unfulfillable–got the notice yesterday. I think you did the exact right thing. Of course, If I were king for a day, I’d say: No charger, no box, no refund. aka you get reimbursed 100% of retail price… but, clearly I have no crown. -Some returns that are still in great working condition, I have used personally, but claim it as a total loss for tax purposes. Beats by dre headphones, a chromebook, etc. -Some I’ve shipped back and sold as used, if in working condition. Returns are always a pain to deal with but on shear volume basis they are a small percent of total, and did not end up making me unprofitable. Some products have a high rate of return and over time I figured not to resell those again. LG G Pad is one example I can think of. Keep in mind that to get a full refund, the buyer must return the product in the exact condition with all the packaging and materials. If there is even a slight discrepancy or an accessory missing or something along those line, I always wrote to amazon, with pictures and description, and got at least a partial credit to me to recoup some of my loss. Wow! Quite the experiences you have. I’m sure returns don’t account for much, the problem I find is that a single return can take so long to resolve, e.g. returning to the store, warranty swap out, etc. A bit optimistic on Amazon handling returns. 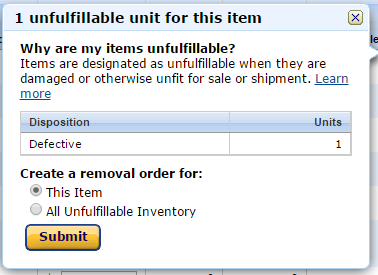 Almost every item I have had returned to Amazon, they mark as unfulfillable. Removal order brings it to me. I see that it is unopened and relist. Amazon marks most things as “customer damaged” and I get to reprocess it for them. Last year, I merchant fulfilled over 1,200 items because it was easier. Certainly it is easier to let FBA pack and ship, but not without headaches. Amazon automatically refunds customer when they request a return. If you don’t keep on top of it, you may never get those items back (there is a service that will check on this for you). When they do get the item back, you have no idea in what condition without a removal order. If they do put it back into inventory and it’s not perfect, you take the risk. I don’t want to scare anybody away from this profitable business, just understand the risks not spelled out above. Been selling on Ebay for 15 years, Amazon for 5. Returns, even at Christmas, are a small part of my sales. This is widely category dependent, electronics have a return rate second only to clothing. YMMV as always. @Dave – it seems to go back and forth. I got a product viewed as customer damaged and it was completely unopened just last week. I’m curious of your categories if you’ve got such low returns around the holidays! I asked Amazon why they mark returns as damaged when they aren’t. Never got a decent response, seems to be at the discretion of whoever handles it, no rules. I’m happy that the inventory isn’t really damaged since getting compensated is cumbersome. It’s just an inconvenience to have to get it back, repack, reship and lose the time when a customer could be buying. I sell very little in electronics, mostly arts & crafts, home improvement & tools, home & kitchen, grocery and toys. Toys have more holiday returns than the other categories. I try to stay away from items that don’t have good reviews, buyers often try to hold the seller responsible for their remorse or product dissatisfaction. Amazon and the big box stores have spoiled customers with lax return policies. I get some items back that are warranty claims, but manufacturers won’t always cover items that were bought in bulk. Cost of doing business, just as a certain amount of fraud is. High margins can entice a seller, need to balance that with other factors. I have a couple of items that sell very well at high margins but are hard to find. I sourced some of each last year which turned out to be defective. I took a total loss, luckily there was no negative repurcussions to my Amazon account. I merchant fulfill a lot, so I have an option that FBA sales doesn’t. Sometimes it makes more sense to refund a customer and let them keep the item. Or give a partial refund if the price or their expectation was the only issue. I just got an iPad back that is completely destroyed. It was returned immediately after the customer received it, so I can only assume they had this one with the shattered screen (with holes in it) sitting at home and ordered one to replace it with and then put the old one in the box and sent it back to amazon. I can’t understand why Amazon would’ve accepted this in the first place. With even a cursory glance they’d have known it was completely destroyed and shouldn’t have accepted it. @Jamie – definitely remember to include detailed photos. That sounds like a pretty open and shut case, although I had a similar one with an MS Surface that took a few weeks to close. Thanks Trevor. I hope that it is open and shut. I just submitted it with photos of the broken screen, packing slip, shipping box, iPad box and inside the iPad box showing the missing accessories. Such a bummer, when I sold it I was so glad that I had sat tight and waited for the prices to go back up after all the inventory from sellers who dropped their prices to move quickly had sold out. Then when I got the notification of the return straightaway after it sold, something told me that I was probably dealing with my first case of fraudulent buyer behavior. Unfortunately my suspicion turned out to be correct. Hope it gets resolved correctly. I just don’t understand why they accept returns that so obviously shouldn’t be taken back. Happy ending. Just got my money back today. it was a little stressful not knowing how they’d handle it, but worked out in the end. @Jamie – Glad to hear it!